HOLLYWOOD -- Bob Dylan, telling reporters that every song he sings is a protest song, announced plans for a nationwide summer concert tour with Tom Petty and the Heartbreakers. The rock stars, who first got together in the Farm Aid concert last fall and earlier this year made a "True Confessions" tour of Japan, New Zealand, and Australia, will hit at least 22 cities in the United States, starting June 9 in San Diego and ending July 19 in Philadelphia. Dylan, a folk and rock music legend whose songs include "Blowin' in the Wind" and "The Times They Are A-Changin'," told reporters Thursday he does not think his music has changed much over the past 25 years. "Every song I sing is a protest song," said Dylan, whose comments during his Live Aid performance last summer sparked the Farm Aid concert. Asked what types of things singers should be protesting today, he replied, "Other people's behavior and maybe their own behavior." Dylan also said he leaves it to his listeners to ascertain the exact meaning of his songs. "You know, everybody sees a different message, I guess, so you have to figure out what it is," he said. "It's like looking at a painting and everybody sees something different." Dylan, who earlier this month received a life achievement award from the national songwriters organization, last toured the United States in 1983, shortly after his much publicized religious conversion. One reporter asked Dylan if he planned "to be Jewish" during the tour. "I'm Jewish only when I have to be," he replied. Asked if he would "be Christian" on the tour, he answered, "Part of the time, yeah." Dylan said he and Petty decided to tour together because "we just felt like it." Petty said the reason for the collaboration was simply "money." Petty also said he was not bothered about Dylan's top billing and playing time with his band. "Your throat doesn't get nearly as sore," he said of the experience, "because Bob's doing most of the work." 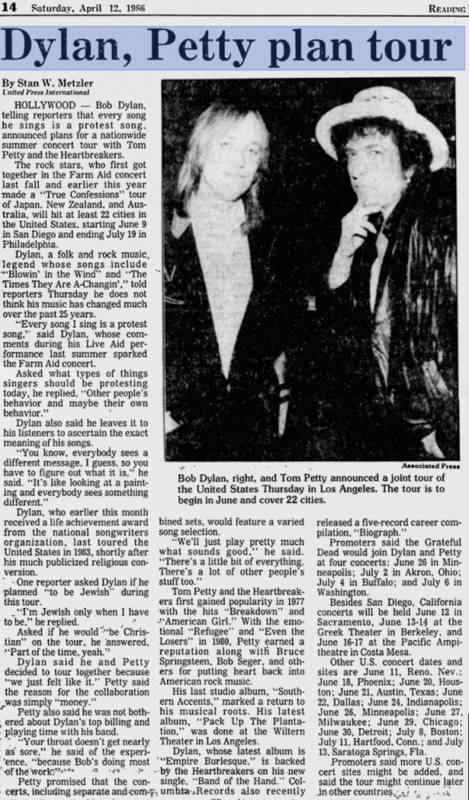 Petty promised that the concerts, including separate and combined sets, would feature a varied song selection. "We'll just play pretty much what sounds good," he said. "There's a little bit of everything. There's a lot of other people's stuff too." Tom Petty and the Heartbreakers first gained popularity in 1977 with the hits "Breakdown" and "American Girl." With the emotional "Refugee" and "Even the Losers" in 1980, Petty earned a reputation along with Bruce Springsteen, Bob Seger and others for putting heart back into American rock music. His last studio album, "Southern Accents," marked a return to his musical roots. His latest album, "Pack Up The Plantation," was done at the Wiltern Theater in Los Angeles. Dylan, whose latest album is "Empire Burlesque," is backed by the Heartbreakers on his new single, "Band of the Hand." Columbia Records also recently released a five-record career compilation, "Biograph." Promoters said the Grateful Dead would join Dylan and Petty at four concerts: June 26 in Minneapolis; June 2 in Akron, Ohio; July 4 in Buffalo; and July 6 in Washington. Besides San Diego, California concerts will be held June 12 in Sacramento, June 13-14 at the Greek Theater in Berkeley, and June 16-17 at the Pacific Amphitheatre in Costa Mesa. Other U.S. concert dates and sites are June 11, Reno, Nev., June 18, Phoenix; June 20, Houston; June 21, Austin, Texas; June 24; Indianapolis; June 26, Minneapolis; June 27; Milwaukee; June 29, Chicago; June 30, Detroit; July 8, Boston; July 11, Hartford, Conn.; and July 13, Saratoga Springs, Fla.
Promoters said more U.S. concert sites might be added, and said the tour might continue later in other countries.